Persian, known locally as Farsi, is the official language of modern day Iran, parts of Afghanistan and the central Asian republic of Tajikistan, but historically it was a more widely understood language in an area ranging from the Middle East to India. Significant populations in other Persian Gulf countries also speak Persian. The difference between Dari Persian, mainly spoken in Afghanistan, and Farsi has been compared to the difference between European and Canadian French. Persian is written in the Arabic script but belongs to the Indo-European family of languages, so speakers of European languages should find learning Persian relatively easy to begin with. It is remarkable simple in terms of formal grammar - there is no gender, no noun inflection and no irregularities in verbal conjugation. 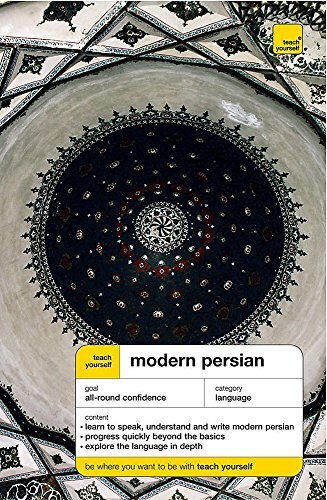 The title is designed for the true beginner and self-access learner, starting from the basics of learning the Persian alphabet. By the end of the course you should be able to build complex sentence and communicate in a wide range of everyday situations. There's plenty of practice of each point as it is introduced and accompanying CDs are available to improve your speaking and listening skills. Narguess Farzad is a lecturer in Persian at the School of Oriental and African Studies, London.